With Tyler Eifert, Tyler Kroft, and C.J. 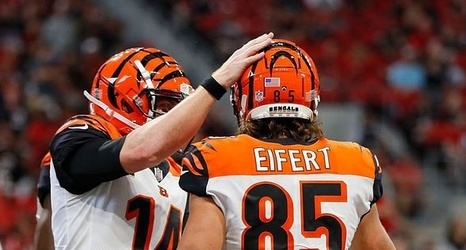 Uzomah carrying the unrestricted free agent tag entering 2019, TE’s are a focal point for the Bengals free agency plans moving forward. With each player adding something different to the offense, the coaching staff will have to decide who’s a fit going forward under Zac Taylor and the new regime. Will they want Eifert’s playmaking skills, Uzomah’s grit, or Kroft’s consistency? Let’s take a look at who should return and why. Tyler Eifert has proved to be a monstrous weapon for the Bengals when healthy.